The Access to Religious Studies series offers a concise and readable introduction to the key areas of religious studies for students and the general reader. 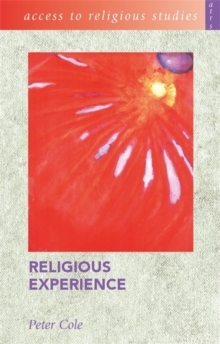 Religious Experience looks at the ways we can define religious experience and at religious experience as a basis for faith. It looks at religious experience within the major world religions and explores the role of mystery in religious practice along with the ways in which a sense of the supernatural is created in worship. The book compares the views of those who believe that religion centres around personal experience against those who believe that too great a stress on personal experience leads toward a spiritual elitism. Religious Experience includes quotations from primary sources, including sacred texts, suggestions for further reading, and practice questions for the various awarding bodies.